Over the weekend I was sitting in the living room, feet up on a stool, eyes closed listening to a CD of Sergei Rachmaninoff (or some spell it Rachmaninov). It was evening and I was feeling fine. Karin came into the room to join me, though didn't really want the music on. Okay, if I'm honest, Rachmaninoff isn't top of my choices either, but I like to try and listen to different sorts of music. "Do you want to try that new vodka, you were given?" she asked. It's not my preferable tipple but I agreed. Karin brought in the bottle. 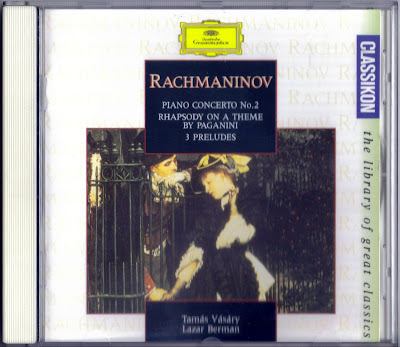 "The brand is Rachmaninoff," she said, "and you're listening to ..."
"Yes, a coincidence or synchronicity," I interrupted. "But did you also know Rachmaninoff died on March 28th and his First Symphony was premièred on the 28 March?" "Says so on the CD cover blurb. In 1897 and 1943." You probably won't know, but Karin's birthday is on the 28th of March. "Oh look," I said, " and the vodka is made in Germany where you were born." "Shall I put Adele on instead?" hi mike another strange coincidence. have been catching up on your stories. i'm still not too good. Hello Tom. Best wishes to you, take care. Great synchro, Mike. Layered too! Mike,have you ever seen the movie "Shine" starring Geoffrey Rush? You should see and hear him play the piano,it is truly an uplifting experience. I saw him about two years ago in Brisbane,I had a seat two rows from the front and it was a marvel to watch him play Rachmaninoff,among other great pieces of music. When I hear the name Rachmaninoff,I immediately think David Helfgott,and that wonderful afternoon in Brisbane,watching and listening to him play. And I see he is coming back at the end of August. So I might have to go again. So,thanks for bringing it to my attention. Oh...and I can see why Geoffrey Rush won the Oscar for his performance of David Helfgott,because David is just like what Rush portrayed of him in the movie. If you get a chance,rent a copy of the movie,I think you will like it,and it will give you a new appreciation of Rachmaninoff's music. I'm now a fan of Rachmaninoff thanks to the movie and David's magic piano playing. Darren, thanks for the intro to David Helfgott, wasn't familiar with him previously (or the movie). Like you say, we never know how far the ripples travel in the sync pool. I like Adele as well, though it took me a while, but her albums now get a lot of plays in our house.